Certainly no spouse ever wants to hear the words, "I had an affair." Those words can shatter a family. The life of everyone in the family is touched when an affair occurs. Unfortunately, statistics tell us that by age 40, 50-65% of husbands and 45-55% of wives have had an affair. Christianity Today reported that 23% of one sampling of pastors admitted to sexual inappropriateness. While the number of affairs by pastors may not match the percentages of the current culture, Christian leadership is not immune to the tragic world of extramarital affairs. According to counselor Dave Carder, an affair often begins when individuals share their mutual feelings for each other. The spark generated by realizing mutual attraction can quickly roar into an uncontrollable flame. Even affairs described only as emotional entanglements are extremely difficult to extinguish. According to Carder, emotional affairs may be more difficult to end than physical and sexual involvement. How the spouse finds out about the extramarital affair is not as important as how the spouse reacts when he or she learns of it. The married couple needs to join forces to look at the situation that truly exists and work together to make it different. The author recognizes that such cooperation is not easy to achieve. However, he sees it as essential for restoration of the relationship. Working together is difficult because affairs often exist in an artificial experience in the midst of reality. Unreality is usually chosen to avoid the pain and stress that exists in the marriage or its context. Recovery from an affair will necessitate that reality for both mates is clearly understood by each other. Then the couple can begin the process of developing vital relationships that are stronger and more honest than what previously existed. An affair can start when someone outside the marriage breaks the language code for unmet needs. As they begin to meet needs at a level desired by the other person, in many ways they gain a level of control over the other person. The affair can take on an addictive tendency. The affair provides a false sense of safety in a world that is really falling apart around the couple having the affair. The illicit relationship provides a fantasy world with a false sense of security. 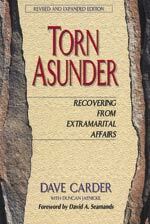 Carder classifies affairs into three categories: "one night stands," "entangled affairs," and "sexual addiction." All of these forms of extramarital affairs bring pain to the marital relationship. That pain requires grieving for the healing process to take place. A part of grief is appropriate anger. Anger needs to be expressed and understood for it to be a part of the healing process. When an affair comes to light, it is not the time to begin a competition with the "other" person. But, divorce is certainly not the healthiest choice to resolve problems in the marriage either. Tough issues must be faced and understood to reframe the reality of the marriage. Restoration is not an easy way out. It may be a lengthy process. However, there is hope for recovery from extramarital affairs. This book will be a helpful companion to the couple that begins the journey towards recovery from an affair. It will be an encouragement to those deciding what path to choose. was published by Moody Press in 1995.